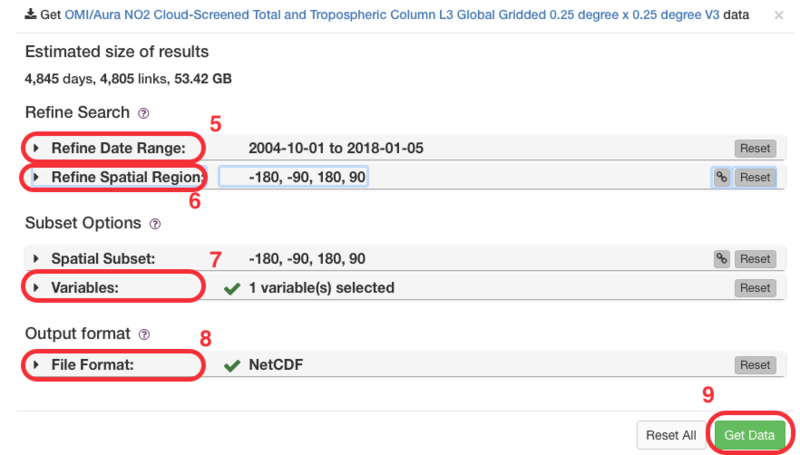 The following will teach you how to download NASA data from three different sources: GES DISC, Earthdata, and Simple Subset Wizard. 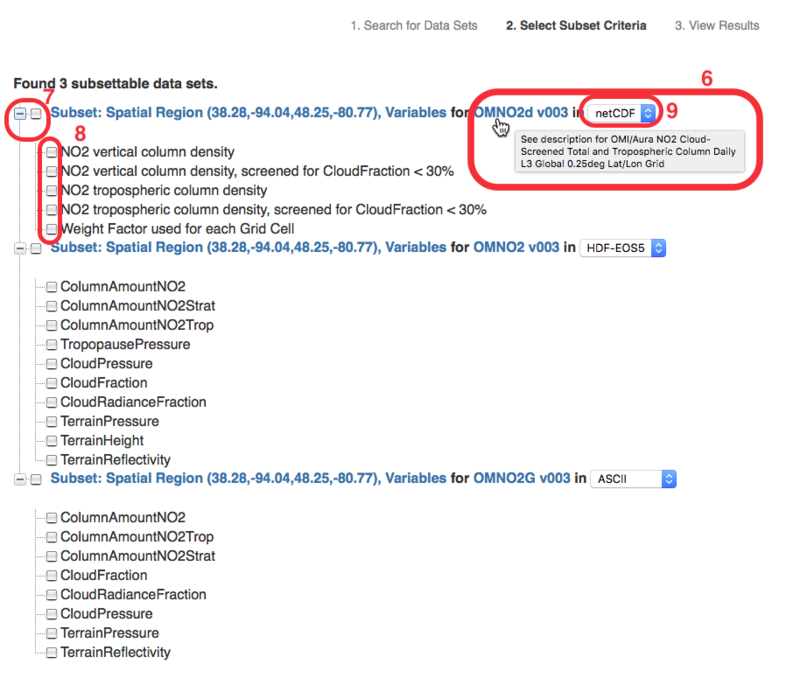 Each of the instructions use the OMI-Aura instrument as an example, but the instructions hold true for whatever instrument you’d like data from. A pdf version of this tutorial is available here. Note: Though NASA data is free, you will have to register in order to download the data. To do so, follow the instructions that NASA gives you when you finish choosing your data products. Using GES DISC: Allows you to specify the specific places and time ranges for which you’d like data. This strategy allows you to specify the specific places and time ranges for which you’d like data. This is helpful if you if you do not want an enormous worldwide dataset. Enter your search term (e.g. : NO2). Many different results will appear; make sure you find OMI L3 data to get interpreted & gridded data. Note: L3 signifies that the data has been gridded. Click here for more on data processing levels. Click Refine Date Range to select the range of dates for which you’d like data. Click Refine Spatial Region to focus on the area for which you’d like data. Note: Refining the spatial region automatically populates the spatial subset and vice versa. Click the Variables dropdown and choose the variable you’d like to download. Click File Format dropdown to choose the file you’d like. Click Get Data to begin downloading your data. Select Download links list. It will save as a text file. In order to retrieve your data, click Instructions for downloading and follow the instructions that best suit your software. Using Earthdata: Allows you to subset data temporally (but not spatially), and look at the data in an interactive manner. Earthdata also allows you to subset data temporally—but not spatially—as well as to look at the data in an interactive manner. You will be taken to a screen with the data collection you selected. This collection will include all the data available for your product—in this case, daily column totals going back to 10/1/2004. To temporally subset your data, click Back to Collections. Add this collection to your project by clicking the green + sign. To select the specific temporal granules you want, click your data product. Earthdata can visualize your selected data, during the time period you chose, for specific regions. To do so, find your location by dragging the map and zooming in or out. Selecting the area on the map for which you want data. To download your data, click download data. To access your data, go to https://wiki.earthdata.nasa.gov/display/EL/How+To+Register+With+Earthdata+Login and follow the instructions that best suit your software. Use Simple Subset Wizard: Allows you to easily subset your data by space and time. It has no interactive features. Simple Subset Wizard allows you to easily subset your data by space and time. It has no interactive features. You can search by keyword (eg. : OMI) or data set (searching by data set assumes that you know exactly which set you want). Search for OMI NO2. Click the map icon to select the area for which you want data. Click Search for Data Sets. Hover over each data product for a brief description, or click the product to read the details of the set. Expand each subset to see individual data products. Select the specific product you want. Choose your preferred file format. Click Subset Selected Data Sets. Click Downloading Instructions and follow the steps to retrieve your data.